No. 6 Oklahoma (10-1, 7-1, No. 6 CFP) at No. 12 West Virginia (8-2, 6-2, No. 13 CFP), Friday night. The winner goes to the Big 12 championship game. 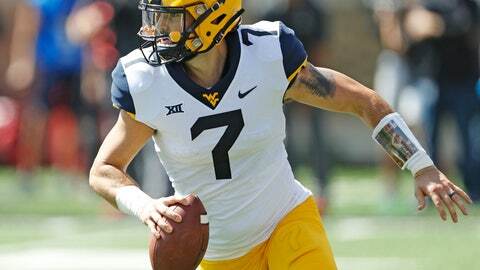 The loser would need help to set up an immediate rematch Dec. 1 between Heisman Trophy-contending quarterbacks — OU’s Kyler Murray (301 yards passing per game, 34 TDs) and WVU’s Will Grier (333 yards passing per game, 33 TDs). Three-time defending Big 12 champion Oklahoma has averaged 53 points its last seven games, including a five-game winning streak since its 48-45 loss to Texas. West Virginia is coming off a 45-41 loss at Oklahoma State. The Sooners have won all six meetings since WVU became a Big 12 member, though Oklahoma is the only team Grier hasn’t faced as the Mountaineers starter. He missed last year’s game with a broken finger. No. 11 Texas (8-3, 6-2, No. 14 CFP) at Kansas (3-8, 1-7), Friday. The Longhorns get to play for their first Big 12 title since 2009 if they beat Kansas. Lose, and Texas will need help. The Jayhawks, wrapping up their 10th consecutive losing season, play their last game for outgoing fourth-year coach David Beaty, who is being replaced by Les Miles after the finale. The Longhorns are more than two-TD favorites and are 14-2 in the series, but lost in their last trip to Lawrence two years ago before coach Tom Herman arrived. Oklahoma State offense vs TCU defense. Oklahoma State is second in the Big 12 with 520 total yards per game while scoring 40 points a game — and is coming off that big home win over West Virginia to get bowl eligible. The Horned Frogs are at the top of the league in total defense, allowing 350 yards per game. TCU held Baylor to a season-low nine points last week. The Big 12 has five teams bowl eligible, and could add as many as three more since all three league games Saturday include 5-6 teams. Two of those, Baylor and Texas Tech, play each other at the home of the NFL’s Dallas Cowboys, the site of the Big 12 title game a week later. Kansas State has to win at No. 25 Iowa State or miss a bowl for the first time in nine years. TCU has to win at home against Oklahoma State to reach a bowl for the 16th time in coach Gary Patterson’s 18 seasons. TCU senior defensive end Ben Banogu is coming off a 10-tackle performance at Baylor, where he had four tackles for losses and a sack. Banogu has 6 1/2 of his 7 1/2 sacks in Big 12 play, along with 15 of his 16 tackles for loss in conference games.